Reading a country guide, I learned that five trees make an orchard. This came as a shock to me. Only five trees? It challenged the image in my mind from a visit to an apple orchard in Cortland when I was a kid: straight lines of fruit laden production fading on a diagonal into the horizon to infinity. Now I see a gaggle of fruit trees here or there splotched into these raggedly divided patches of family land on the French countryside and realize there's something great in the whole idea of a five tree orchard, the smallest possible, but an orchard nonetheless. I am now standing in the autumn of my fifth year on the blog. I am looking back at the archives at what I have to show for it. What do I see? My orchard. First, I see improvement. Sharing through this blog has improved my photography and writing. When I look back on how this all began, I see that I have come a long way. The first fleeting images, labored assemblage, pushing hard to get on top of the code learning curve, these struggles seem so far from where I am now. Without the structure of the blog to keep me practicing all the time, I doubt I would have been able to make the kind of progress I have in the last five years. For that I am thankful. Second, I see friendship. Over the years, through the blog, I have reached out to a world that reaches back to me. I have had so many great exchanges and friendships come from the blog. Kind words of encouragement from afar, people who saw my blog, contacted me, and are now steadfast everyday friends, and professional mentors have all come to me this way. I am so thankful for you all. Third, I see a body of work. It's like I have been working on a quilt. Piecing it together, the seasons like pinwheels, stars, themes emerging. As the years go by, they are placed in particular order year after year. Getting the archive organized into seasons like chapters and the recipes organized into categories has helped immensely. Fourth, I see a new cycle, something new that only recently has revealed itself to me. You see, all that I have written falls within a framework. Throughout the last five years, I have worked on distilling images and ideas that were collected throughout my life. But at the same time, there were projects, hopes, ideas and events that were not complete yet, because I was in the process of living them, hashing them out, being disappointed by them, rushing headlong into them. When I sat in one late afternoon's last golden rays and I dove in head first to write about one simple moment with a man and a fruit that happened years ago in Beijing, all of these other things in my life were still going on full blast, tearing by at full speed. So now, when I scroll through the titles of my entries in the archive, I see in their titles little anchors in my mind to new stories, ones that have rested and had a chance to clarify, the stories I'm working on now. I am so thankful for these markers. The fifth but maybe the most important thing I see is regular meditation. Five years of quietly turning my attention to what is good in my life has been good for my soul. Even when things got hectic and tasks like changing diapers and singing lullabies have interfered with blogging, this meditation continues. Five years of finding ways to celebrate with traditions, honor the beauty around me, and to show my love has improved my relationships with the people I care about the most. Lets lift a glass to Autumn! To the orchard! It's harvest time. I absolutely love your blog-it's so well written and your photos are always beautiful and the food-magnificent! What a lovely sermon on LIFE!! A movie nun once said that Life consists of three steps: Preparation, Meditation, Dedication. And we're all in progress on all those, all the time, I think, whether we're aware or not. I've loved these steps with you, and look back as you do, for a special moment, a certain picture, a time of celebration, a recipe for a tart crust---and in these, I also see the changes. But you started out in such a wonderful way, and in such earnest giving from your heart, any and all improvements are just lagniappe. The diapers and lullabies aren't interference---they're pleasant interludes, all a part of the fabric of this wonderful quilt you've created. And you've included us all in the sitting around the frame, looking on and enjoying every stitch. Lucy - your reflective moments so beautifully woven serve as both a reminder to pause in our busy lives and to savor the tiniest pleasures along the way. Santé! Thank you for including us into your orchard. Dear Lucy, I really enjoy your blog. I find it original and although the pictures are beautiful and inspiring, I also really appreciate that your writing is so good. That is what keeps me coming back! Lucy, This could be one of the most beautifully written anniversary posts I've ever read. I raise my glass to you too, for everything you say here and for the sense of happiness and reflection you've given me for just reading your words. Cheers! I recently found your blog, and I must say, I love it. I find it very inspiring. Congrats on five years. Excellent post, especially the way you have woven the points, as though weaving a beautiful quilt. All the best for your writing. Blogging is an amazing meduim and this post hit the nail on the head. It's through blogging that we find who we really are and are capable of, which is great things. Thanks for sharing your gifts with us. My goodness, how beautifully put. I love my little blog and I love the fact that I am recording the little moments of life that would otherwise fade or merge into fuzzier memories. Yours is one of my absolute favourite blogs. I can almost taste and smell your photographs. Thank you. 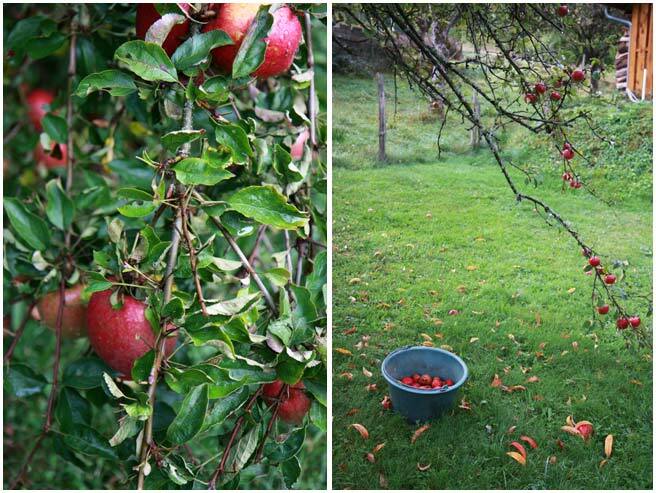 We have just one apple tree and that's plenty! There are apples everywhere! What a wonderful post, thank you. These are truly words to remember. 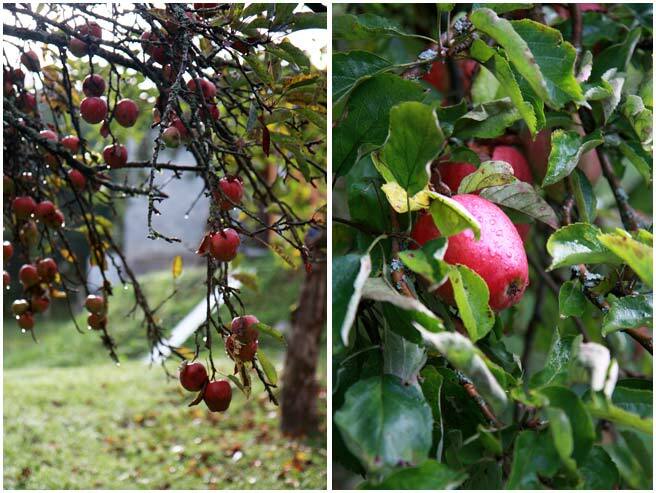 Thank you for sharing your orchard with us. For every reason given by the preceding comments, your blog is always at the top of my "bookmarks" list. I have four fruit trees (one lemon, one plum, two pear), and come harvest time, I definitely think they constitute an orchard! Congratulations on your five years. I've been thinking a lot about Lyon lately, with the French demonstrations so prominent in the news. Your post is a peaceful contrast to what must be happening in your city just now. A beautiful post, written by the lovely, caring, thoughtful person that I've come to know through your blog. I hope someday to meet you in person. Thank you for this beautiful post. I'm tempted to print out a copy and tape it above my computer, just so I'll always have a reminder to keep the bigger picture in mind. Whatever our motivations from day to day may be, these are ultimately the reasons we blog, aren't they? To nurture something, and have it nurture us in return. Here's to the orchard, and another five years! Congrats on your 5th anniv! I love your thoughtful blog. You are an inspiration. Thanks for sharing. The belief that five such beautiful apple trees make an orchard seems just right . Your blog and the best of French cooking show the essence of good eating . Congratulations on five sucessful and satisfying years and thank you for sharing it all ! This is great news. We planted six apple trees two years ago, but the Moose got one this winter. Good to know we still have an orchard!